Mr. Ejaz Inamdar, CEO & Director on the occasion of the 22nd Anniversary of Intermedia Cable Communication Pvt Ltd and 4th Anniversary of ICC Digital at Intermedia Cable Communication Pvt. Ltd.
Mr. Razzak Khan, Chairman & Managing Director, while praising the entire staff of ICC. said this achievement was possible only because of the efforts and dedicated teamwork put in by the engineering and technical team. It's with great pride that we announce the successful launch of HD DVR set top box for viewing ICC DIGITAL HIGH DEFINITION PROGRAMMING, thus proving our leadership in the Cable Television Industry. ICC today announced that it has successfully introduced its third generation High Definition Programming - which delivers stunning picture quality with 51 channel audio capabilities and a new level of interactIvity with DVR - a facilIty never experienced before Building on its early lead in the Cable TV Industry and proving thc prowess of HD, 1CC has now added new HD Programming using MPEG4 H264 to technolog to enhance its portfolio of Digital Services. According to analysis, the sales of HDTVs grew 52 percent between January and September of 2010. With the continued growth over this most recent holiday selling period and throughout 2009/10, it is anticipated that the demand for HD Programming will complement the demand and adoption of HDTVs. HD is the consumer's choice for the next generatlon There Is no other high definition content in the market that can meet this demand as compared to the HD Programming from ICC D1GITAL To match the resolution of your display. ICC HD STP outputs HD content through the industry standard HDMI interface in 720p. INTERMEDIA Cable Communication Pvt. Ltd. (ICC) is Pune's biggest cable TV network and amajor Head End Service Provider. The company is known for delivering distinctively unique and superior sound and picture quality and high speed broadband services to its subscribers. Towards digitalising its Cable TV Services, ICC had applied for certification of their integrated Conditional Access and Subscriber Management Systems to conform with TRAI Regulation No. 4 of 2009, to BECIL (Broadcast Engineering Consultants India Ltd.), the designated consulting, auditing and certifying authority by the Govt of India. Upon consultation with BECIL and implementation of various recommendations, ICC has achieved World Class Quality of Service (QoS), and has been awarded BECIL's Certificate for Conformity to TRAI Regulations. ICC has installed industry leading IRDETO CAS for its Conditional Access System and a robust Subscriber Management System from Media Nucleus. 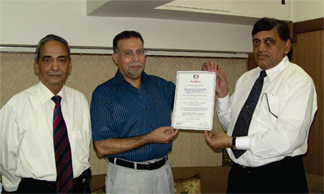 The Certificate was handed over to Mr. Ejaz M Inamdar, CEO &Director of ICC by Mr. Harkesh Gupta, Chairman and Managing Director of BECIL and Mr. V.C. Khare, Technical Advisor, BECIL, on Feb 26,2010. Indian Cable TV networks, despite their relatively small size and entrepreneurial nature, have always been quick to adopt leading edge technology. In the past, widespread optical fibre deployment, cable modem services and even telephony are some of the enhanced facilities that Indian cable networks have offered their consumers. In the recent past, DTH networks have created an aura or high technology and enhanced services though in reality they offer little more than that on 'Vanilla' services already offered by most cable networks countrywide. * High speed internet and voice telephony through cable modems. * True two-way interactive services. Services like two-way interactivity are mimicked by DTH but require a separate dial up internet return path. HDTV is also possible through DTH but the large bandwidth requires makes it an extremely expensive proposition. PVRs have been promised by Indian DTH service providers for more than 2 years but no such service has yet been launched. Intermedia Cable Communications Pvt. Ltd. is part of the Intermedia group of companies. The cable TV network is Pune's dominant MSO and has been rapidly growing and innovating for the past 8 years. Today, the MSO provides cable TV into more than 40,000 homes and has partner with more than 150 last mile operators. Its entire network is 860 MHz, delivering 90 analog channels and 180 digital CATV channels simultaneously to all its consumers. It charges a monthly fee of Rs. 260 + tax,(Rs. 337) in line with the TRAI's recent cap on CATV monthly subscription. ICC provides its consumers the option of switching to digital and receiving upto 180 channels, at no additional monthly subscription except the TRAI dictated STB rentals of Rs. 30 per month with an initial refundable deposit of Rs. 1000. The ICC digital service utilises IRDETO encryption. Key headend hardware has been procured from a variety of international sources including Harmonics, Scientific Atlanta and V-shine. BEST DIGITAL STBS IN INDIA ? ICC has deployed digital STBs from 'DIZIPIA'. "These STBs have been custom designed for us by Dizipia, through an interactive process spread over more than 6 months.Engineers from Dizipia (South Korea) were at our facilities during the period, closely understanding our needs and implementing them in a unique product customised for us" says Ejaz Inamdar, Director & CEO, ICC. * Automatic Multilingual Audio Selection Based On User Preference. * Live Preview Of Upto 16 channels On A Single Screen. More than two decades ago, television viewing was closely linked with the Video Cassette Recorder (VCR). the VCR provided external content. That function is now taken over by DVD players. However, the VCR also permitted recording of programs to be replayed later at a more convenient time. This is referred to as 'Time Shifted Viewing'. This facility is sorely missed since the demise of the VCR. One of the VCRs disadvantages was the wear and tear of the video head and the VHS tape. Technology has now advanced sufficiently where digital CATV or DTH content can be easily recorded on a Hard Disc Drive (HDD). The HDD can be reused indefinitely with minimal wear and tear for recording and re-recording content. Most PVRs also offer the facility for the consumer to watch one channel while simultaneously recording another channel. Such a device is called a "Personal Video Recorder" (PVR) or is sometimes also referred to as "Digital Video Recorder" (DVR). However, the channels and content providers do not want their content to be pirated by recording it and replaying it for public viewing or by multiple, third party viewers. As a result PVRs are designed so that the hard disc is 'paired' with the STB and will only replay its content on the same STB from which the content was recorded. Hence, even though the ICC PVR has an external HDD for recording TV programs, the same at HDD will not work if loaned to a friend to view recorded programs. This feature is required by broadcasters to protect content and the ICC PVRs provide this as an in-built security. Most Indian consumers have not yet been introduced to HDTV even though it has become a popular catch word for TV salesmen selling flat panel TV sets. While details of HDTV have provided in the technical article this month, briefly, HDTV provides upto 20 times the information contained in a normal TV picture. The aim of HDTV is to provide a picture that matches that of film. As explained in the technical article this month, there are various levels of HDTV delivery. True HDTV is delivered at 1920 x 1080p. There are several other lower resolution formats including 720 x 480i which provides less than half the picture quality of True HDTV. Most flat panel TVs (LCD & Plasma Display based)today boast of being at least 'HDTV Ready' while others promise 'HDTV' or even 'Full HDTV'. However, there is almost zero HDTV content available to both the consumer or even at TV retail showrooms to demonstrate the quality and impact of HDTV. HDTV content needs to be photographed in high resolution using special HDTV cameras. The entire chain of video processing, post camera shooting must also be HDTV. In the West, several channels, including National Geographic, Discovery & others offer HDTV broadcasts, until a month or so ago, there were no HDTV transmissions available on satellite. Magazine readers will recall reports in this magazine that luxury & lifestyle channel LUXE.TV TV had commenced HDTV broadcasts from the AsiaSat-2 satellite, located at 100 deg East. The channel is transmitted in HDTV at 4000 MHz, SR 28,125; FEC 3/4 and Horizontal polarisation. VOOM TV is the only other HDTV channel currently avaiable over India. The VOOM HD channel is delivered in 1080i ( i.e HDTV Ready - Not True HD TV)format high-definition with Dolby Digital 5.1 audio delivering 6 channels of surround. It offers content on adventure travel, fashion, luxury lifestyle, art, live concerts, action sports and video gaming. VOOM TV is a broadcast from the MeaSat-3 satellite, as a Free-To-Air C band broadcast @ 3752 MHz, Vertical polarisation, SR 13330 & FEC 2/3. Though reception of HDTV satellite broadcasts is done using the same dish antenna and LNB, it requires special HDTV satellite receivers for decoding the HDTV signal. Further, (extremely expensive) HDTV digital encoders are required at the digital headend. "Our digital network with 256 QAM delivery, is ideally suited for digital HDTV transmission" points out Inamdar. ICC currently offers 5 HDTV channels. Besides 1 received by a satellite, the other 4 are in-house channels which have HDTV content on its hard disc servers at the headend and the content is continuously played out from the hard discs. "Obtaining HDTV content is our biggest challenge" says Inamdar. "We have approached several channels which provide HD content in the US and Europe but they are not ready for HD content in this region. I guess being a pioneer always has its difficulties" smiles Inamdar. He is however hopeful that he may obtain some children's channel content in HD, from an existing broadcaster. In the immediate future, ICC plans to deploy HDTV compatible STBs to premium customers who have home theatre installations and can actually view HD content. ICC also plans to down sample the HD content for standard definition TV viewing. A demonstration clearly showed that even down sampled HDTV content appeared richer and superior than the regular SDTV content However, the HDTV picture was simply breathtaking, when viewed on a 46" True HD (1920 x 1080p) LCD TV. * HDMI & Component Video outputs. * Dolby digital sound with 5.1 channel support. Interestingly, the HDTV STB has an ethernet port with an RJ45 connector. This will provide a reverse path for the STB. Using this facility, customers can opt for full interactivity and control including on demand viewing of pay per view movies, an interactive yellow pages directory and various other value added services planned. ICC plans to deliver upto 8 Pay Per View channels through Cable TV and is accumulating content for this. Queried about is gold for ICC, the CEO - Mr Inamdar says "Our intention has always been to provide the highest level of service and support to all our customers. We have always maintained a personal touch and it will be our endeavour to ensure that we maintain personal contact with all our customers to ensure that they receive the highest quality of service, for any of our activities."